The Irish coastal city of Galway was the spot to be for EGOV-related discussion and networking from 4 to 6 April 2018. 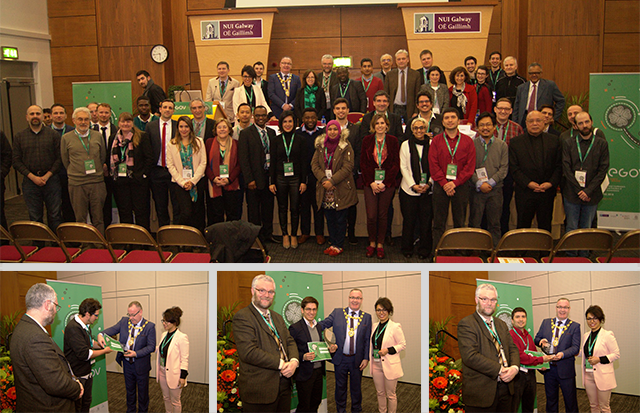 The 11th edition of the International Conference on Theory and Practice of Electronic Governance (ICEGOV), co-organized by the National University of Ireland Galway, the INSIGHT Centre for Data Analytics, and the United Nations University (UNU-EGOV), was a resounding success during its 3 days. took the top spot regarding attendance, with Ireland, India, Argentina, and Germany closing the Top 5 of countries attending ICEGOV2018. 18 paper sessions provided many hours of fruitful discussions and sharing of ideas between authors and the audience, complemented by 8 invited sessions with a regional focus and organized by leading institutions in the EGOV domain, such as OECD, The World Bank, and UNESCO, among others. The conference programme was further enriched by keynote lectures by people from distinct fields, such as Ciarán Cannon (Minister of State, Government of Ireland), Stephen Ibaraki (Social Entrepreneur and Futurist), Vincenzo Aquaro (UNDESA), and Viswanath Venkatesh (Distinguished Professor, University of Arkansas). Finally, a Doctoral Colloquium, aimed specifically at PhD students’ research, and a set of 6 workshops took place as pre-conference events on 3 April 2018. A number of publications will follow ICEGOV2018: the conference proceedings, comprising a total of 104 papers split in 12 tracks, are to be published by ACM Press, while a special issue of Government Information Quarterly will be published by Elsevier with selected best papers. As usual, it is expected that the conference papers are indexed in Scopus, Web of Science, and DBLP – Computer Science Bibliography. Prior to the double-blind peer review process, a total of 184 papers were submitted, making ICEGOV2018 the edition with the second-highest number of submissions to date. Continued intention to use online participatory budgeting: The effect of empowerment and habit by Mijail Naranjo Zolotov, Tiago Oliveira, and Sven Casteleyn. Convergence or Conflict? Digital Identities vs. Citizenship Rights: Case Study of Unique Identification Number, Aadhaar, in India by Nidhi Vij Mali and Martha A. Avila-Maravilla. Serious Gaming for Developing Open Government Data Policies by Local Governments by Fernando Kleiman, Marijn Janssen, and Sebastiaan Meijer. With ICEGOV2018 successfully concluded, it is time to prepare for the 2019 edition, which will take place in Melbourne, Australia.